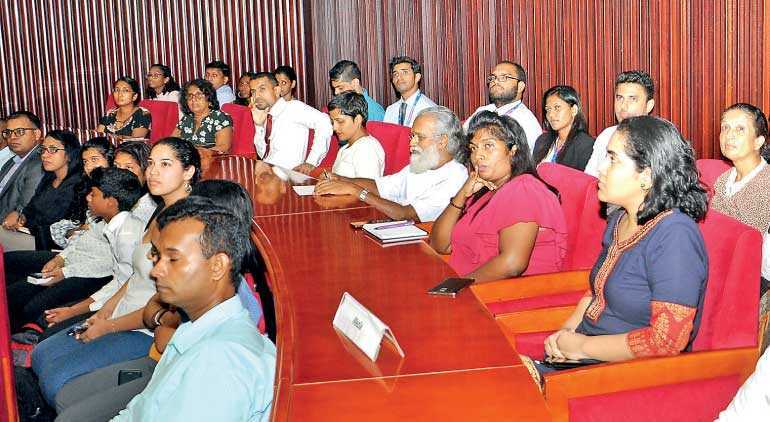 In an effort to set forth a cohesive discussion on the opportunities available in response to threats and impacts posed by climate change, Dilmah Conservation and Global Compact Network Sri Lanka and Biodiversity Sri Lanka organised the inaugural Climate Reality forum recently. Perspectives on the reality of climate change, impact and assessment of climate change in Sri Lanka, Government strategies and opportunities addressing climate change in Sri Lanka, and insights on climate risk management, and the role of the private sector in climate change adaptation were among some of the topics discussed at the forum on 31 July. The forum incorporated a number of professional representatives from the Government, businesses, and private sector which included Dilmah Conservation CEO Dilhan Fernando, University of Peradeniya Department of Agriculture Agro-climatology Principal Scientist Dr. Ranjith Punyawardene, International Union for Conservation of Nature (IUCN) Species Revival Commission Former Deputy Chairperson Dr. Rohan Pethiyagoda, Ministry of Mahaweli Development and Environment Climate Change Director Dr. Sunimal Jayatunga, and the World Resource Institute and Climate Resilience Practice, India Adaptation Strategy Director Dr. Nambi Appadurai. Sharing insights into global and national trends on climate change and sectoral vulnerability impacts and opportunities, University of Peradeniya Department of Agriculture Agro-climatology Principal Scientist Dr. Ranjith Punyawardena said that the warmest years in recorded history occurred during the last decade. He also mentioned that the greenhouse effect was one of the major catalysts for the recent increase in global warming. According to Dr. Punyawardena, the Carbon dioxide (CO2) concentration of the atmosphere is increasing at an alarming level which affects the climate change negatively. “We know that global warming is occurring due to the greenhouse effect. These greenhouse effects, ultimately lead to the climate change. After 1750, the greenhouse gas concentration in the atmosphere has been sky rocketing. About 45 years ago, the CO2 concentration of the atmosphere was 0.03%. Now the new generation has to learn that the CO2 concentration in the atmosphere as 0.04%. Within our lifetime it has risen 0.01%. A huge amount of heat is entrapped due to the greenhouse effect. This effectively leads to a negative impact on climate change,” he said. Dr. Punyawardena also mentioned that there is a very clear cut and significant increase in the ambient temperature in the country. According to various studies conducted, the ambient temperature is increasing at a rate of 0.01% to 0.03% annually, with frequent droughts and floods. 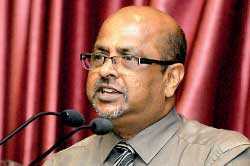 Speaking on the effects of climate change on the annual rainfall, Dr. Punyawardena said that there is no decrease or increase in the amount of rainfall received annually as there was insufficient evidence to prove that there was a trend in the rainfall received. “There is a misconception saying that with climate change, the annual rainfall is decreasing. I will say with all the responsibility, our annual rainfall is neither decreasing nor increasing. There is no trend in the rainfall. We get more rain when it is not needed, and we don’t get rains when it is needed. In summary, if you take rainfall recording stations, there are about more than 400 stations governed by the Government and the private sector. Around 10% of these stations will show an increasing trend, another 15% will show a decreasing trend, while the remaining 75-80% will not show any trend in the rainfall. The only aspect that has been effected is the timing of the rainfall. The timing has become highly erratic. This results in more droughts and more floods. He also mentioned that the intensity of rains have increased as a result of climate change while the number of rainy days have decreased. “The intensity of the rains we receive have increased, which also results in an increase in flash floods. After 2005, our rainfall intensity has increased, both in the Central Highlands, and also in the dry zone. Even though the rain intensity is increasing, the number of rainy days are decreasing. 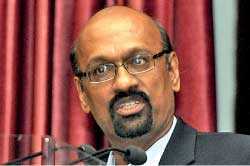 This will have a significant impact on the agricultural productivity of the country,” Dr. Punyawardena elaborated. He also noted that there will be a noticeable increase in the temperature in the future. He says that the studies conducted by various institutions show that there will be an increase of the temperature by two to three degrees at the turn of the century than that of today. According to Dr. Punyawardena, the increase in temperature will be significant in the Central Highlands, and the Northern Province. “All these studies show that the dry zone will become even drier, while the wet zone will become even wetter in the years to come. The dry zone will experience a more intense drought than that of today, whereas the wet zone will experience more excessive rainfall conditions than today,” he added. In his final remarks, Dr. Punyawardena said that the threat posed by climate change is a reality. “It is true that the threat of climate change is there. All the studies we conduct arrive at the same conclusion, that it is real threat. It will affect all the sectors of the economy, especially agriculture, tourism, health, and transport. There are no sectors with immunity to this complication. All of the sectors are vulnerable to climate change. If you want to sustain, you have to adapt to this situation. That means the need for smarter strategies. We also need to have an attitudinal change. Without changing our attitude we will not be able to face this dilemma successfully,” he concluded. 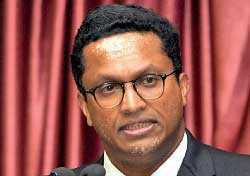 IUCN Species Revival Commission Former Deputy Chairperson Dr. Rohan Pethiyagoda who spoke at the forum said that the impact of climate change on biodiversity is catastrophic. He also noted that the worst impact will be suffered by the oceans. “If we talk about the impact of climate change on biodiversity, it is catastrophic. The worst impact is going to happen to the oceans. The oceans today are acidifying at a rate that exceeds anything we have seen during vertebrate evolution. The last time the oceans saw this kind of acidification trend was 252 million years ago when the Earth saw the Permian Triassic extinction. The acidification of the oceans means that all the animals that depend on Calcium carbonate (CaCO3) for their exoskeletons cannot survive. The very bottom of the food web is taken out. When the Great Dying took place 252 million years ago, 90% of oceanic species became extinct. That is what we are looking at unless we reverse climate change by reducing CO2 emissions,” he said. He also mentioned that different species in order to adapt to climate change engage in various actions. “As the climate warms, species need to adapt or move to colder climates. As we go upcountry the climate cools substantially. Trees and animals that are now at sea levels in forests have to migrate upwards. Two problems arise here. One is that we have fragmented our landscape so radically that the migration of species becomes very difficult unless we build substantial habitat corridors that enable this to happen. The other problem is that the species who live on the highest peaks have nowhere higher to go. We are looking at major species extinctions in this area,” he added. Dr. Pethiyagoda noted that the only way to dampen the impacts of climate change was to decrease the CO2 emissions released. “In the whole climate change scenario, there is only one number that matters. That is the atmospheric concentration of CO2. Everything else comes out of that one simple fact. Over the past 1000 years we had an atmospheric concentration of CO2 less than 300ppm (parts per million), we are now well over 400ppm and aiming for the sky. 400ppm is something that we have not seen before in evolutionary history. As in the past 400,000 years, CO2 concentrations have varied. Global sea levels have varied by as much as 400 feet. The last time atmospheric CO2 exceeded 400ppm was 17 million years ago. Long before many of the species that walk the Earth today had evolved. During that time we only saw a sea level rise of 100 feet. The reason this is important is, we are only tweaking one number here. Only the greenhouse gases. The other consequences of that tweak will follow. That is what we need to be ready for,” he elaborated. In his remarks, Dr. Pethiyagoda said that although Sri Lanka had come a long way in the use of renewable energy, we need to do more. 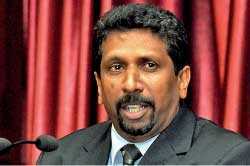 He mentioned that as Sri Lanka was a developing country, the energy requirement will only increase. “Our electric energy consumption at the moment is low. To become a fully developed country, we are going to increase the energy consumption by 10 times. As we industrialise, the energy component supplied by the renewable resources we use now will not be sufficient. We have to think big into the future. The only technology available at the moment that we can even think about that will provide CO2 free energy is nuclear energy. Thirty-three countries in the world have nuclear electricity, including countries that are significantly poorer than us. There is no reason that we cannot think big into the future. We have no choice but to think big,” he concluded. Speaking on the national strategy to address climate change threats by creating green infrastructure, Ministry of Mahaweli Development and Environment Climate Change Director Dr. Sunimal Jayatunga said that overcoming the threats from prolonged drought and flood conditions was a national priority for the Government. “We have identified three main interventions to address the arising threat of climate change. We hope to enrich catchments and watersheds in the central highlands and river basins. We hope to rehabilitate ancient cascade tank systems in the dry zone, and finally we also hope to divert excess water in the wet zone to control flash floods and to address prolonged droughts in the dry zone. These are the three major interventions that we hope to achieve at present,” he said. The Climate Change Director noted that the Moragahakanda Reservoir project is one of the major projects conducted by the Government to address the climate change threat posed on the country. 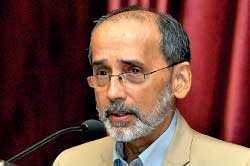 “One of the interventions that the Government is currently engaged is building dams, especially the Moragahakanda reservoir project. It is a multipurpose irrigation project. Our aim is to improve the agriculture, power generation, industrial water supply, and the inland fishery sector through this project. This is the biggest multifunctional irrigation project in Sri Lanka and it contains a water quantity that is six times bigger than that of the Parakrama Samudraya. We plan on providing water for both of the major harvest seasons. We also hope to add an annual power generation of about 110 gigawatts to the national grid. It will also provide safe drinking water to a large population that is affected drought conditions in the dry zone. This project addresses and mitigates most of the effects of climate change,” he added. Summarising some of the economic benefits of the Moragahakanda Reservoir project, Dr. Jayatunga noted that it is slated to provide irrigation water to about 87,000 farmers in districts such as Matale, Anuradhapura, and Polonnaruwa, during both of the major harvesting seasons, and to increase the annual inland fishing by 4,500 metric tonnes. Q: Under UN Red, the UN programme for reducing emissions from deforestation and forest degradation, there are many adaptation strategies discussed in the global context. How can they be applied to Sri Lanka? Anura Sathurusinghe: If we take the Red Plus strategy, we developed and presented to the Government about a year ago, when we talk about forestry, we usually talk about the mitigation. But in this case, in Sri Lanka, what was really important was ecosystem services. We thought of identifying different strategies and policies while looking at the mitigation aspects of forestry and also to look at the adaptation requirement also. For that we had identified 13 policies and measures within three main policy frameworks as forest, wildlife, and the watersheds. We looked at watersheds as one whole landscape while looking at the social aspects. There is a mix of both adaptation and mitigation aspects. Q: What is the UN Global Concept (UNGC) Future Scope for the climate change adaptation? Dilhan Fernando: In the alignment of the environment, there are multiple different interventions, but we must remember that the UNGC is a convening platform and therefore it is reliant on the initiatives of the members. It offers an opportunity for members to work within those seven directions that is mandated by the UN which are very general, to build certain specific interventions. In our case, we work with the UN platform, speaking as Dilmah Conservation, in order to be able to understand best practice globally from the UNGC platform. We use that to be able to optimise what we do, so that we don’t reinvent the wheel, build partnerships and that we are able to share our best practice using UNGC, because ultimately there is no point in us doing something fantastic only on one or two of our estates. We need to be able to leverage it to be able to deliver something that we can look back at. I think UNGC has two functions there, one is to be able to act as a platform to share best practice that will help us to scale up any initiative that the members wish and secondly it also has the possibility to allow the members to share their efforts with others in order to deliver at a national scale rather than making it something that might be isolated. Q: With respect to adaptation and mitigation responses that we should undertake to reduce the vulnerability of Asia to climate change, are there any significant barriers or challenges that would delay or make them ineffective? Nambi Appadurai: One of the key constraints is the interface between science and policy, and how do you convert scientists into policy makers? To me that is a bog challenge. Apart form that the capacities are at different levels, because it is happening at a rapid pace, therefore people coping with different things. But then what happens is that the people cannot accommodate the change in which it happens today. The information flow has to be maintained. Technology is helping us with that. The interactions between science and policy is very critical to me, because a lot of politicians do not understand the complexity of the climate change subject whereas scientist do not understand the intricacies of policy making. Demystifying science is important here. Q: Undamming rivers is the trend today. We have decided in Sri Lanka, in consultation with the president, that we cannot tap our rivers any more for power generation without harming the environment. I do not see how climate change impacts can be reduced by damming rivers. Rohan Pethiyagoda: There is no question that damming rivers, whether for irrigation, flood management or hydropower, carries environmental costs. It is true that in the US many old and/or poorly-constructed dams are being removed. However, the driving reason for this is not environmental but safety and maintenance cost. In Sri Lanka, the institutions whose job it is to provide our farmers with water, and provide all of us with electricity, considered these challenges and came up with solutions. These solutions include the dams which are today generating electricity at a cost of less than Rs. 10 per kWh4, a fraction of the Rs. 25-60 it costs per unit of thermal power. Almost a third of our power now comes from these dams. Speaking on the reality and threats posed by climate change, and how we can respond to these, World Resource Institute and Climate Resilience Practice India Adaptation Strategy Director Dr. Nambi Appadurai said that it was important to look at adaptation and mitigation as response options to climate change at the same time rather than working on them individually. Dr. Appadurai also noted that climate change is a complex subject that needs a thorough understanding to fully comprehend. “Climate change is a subject that needs reiteration and repetition. It is also a complex subject, so it takes time to fully comprehend the threat that it poses to the future of the world. We have to accept the fact that climate change is happening right now and it is here to stay for a long time to come. Wherever you go you hear about climate change, no matter the country or continent. It is a word that resonates with everybody today though they find it a bit complex,” he said. He also mentioned the impacts of climate change on the private sector and how adaptation is the most relevant response option to these effects. “If we look at the impacts of climate change on the private sector, much of the global discussion on adaptation finance has focused on integrating aspects of climate resilience into public sector budgeting and the allocation of international climate finance. It is however, through the integration of climate resilience aspects into the day-to-day decisions of private enterprises around the world, that the most significant adaptation potential in economic development can be achieved. Understanding how these decisions are made and are ultimately financed is critical for establishing the policy frameworks capable to scale-up private sector investment to transformational scale required. Understanding how private sector adaptation investment occurs, what drives it and how it is financed, also is essential. It is a low-cost entrance for Governments and policy makers seeking to increase levels of adaptation,” he elaborated. In his remarks, Dr. Appadurai mentioned that evidence based research and sound monitoring as the most important aspects that we should focus on as responses to the impacts of climate change. “Looking ahead, I believe that evidence based research is very important. Transformative approaches to the problems that we face today are critical when dealing with the threat of climate change. We need to learn from all the different studies that have been conducted and we need to look at how to put them to good use. Sound monitoring and evaluation is important for this. It is also important to invest in the best tools when dealing with this issue. Given the fact that 70% of the urban infrastructure is yet to be built in India and other developing countries. This provides a big window opportunity to all the countries to build climate resilient infrastructure,” he concluded. Providing an overview of the climate change conversation to the forum, Dilmah Conservation CEO Dilhan Fernando elaborated on some key insights from the 2006 Stern Review of the Economics of Climate Change. “In 2006, Lord Nichiolas Stern, who was the Treasury Secretary, now the Vice Chair at the Grantham Institute made three key points in the Review of the Economics of Climate Change. Every country and every individual in our world will be affected by climate change but the poorest will suffer the earliest and the most. Two is that climate change is the greatest market failure in of all time. The third is that the benefits of early action far outweigh the costs. He estimated that at that time, inaction could cost the world at least 5% of global GDP each year whilst the cost of early action, reducing emissions could be limited to around 1% of global GDP,” he said. He also noted on some of the global catastrophes that have incurred due to the ill-effects of climate change. “Just 12 years later from the Stern Review, wildfires are burning in the arctic circle. The fires across Siberia, in the past few weeks have covered 38,000 square miles, the smoke from those fires is evident even over Canada. Last year in Sweden, they had three forest fires. This year they have 40 times that,” he added. Fernando also mentioned that the reasons for the lack of definitive action taken to mitigate climate change was due to economic discrepancies. “A decade ago, there were environmentalists who fought for acknowledgement and action on this climate reality and on the other side, there were state and business lobbies that sometimes responded but mostly did not. The reasons for the lack of response were mostly economic. Adapting is often thought not to be good for business. In spite of all this, the world still has the same perception, because it is burning more fossil fuels today and apart from other consequences, also killing millions from air pollution,” he elaborated.